The genius of the humble sandwich is its efficiency. Why eat cheese, meat, bread, and sauce separately when you can stuff yourself with all four simultaneously? This way you have more time to change the face of civilization and a free hand to look at memes. We still aren't using this technology to its fullest potential though. Consider the fact that we still eat our fries on the side. Well no more: Meat-forward fast-food chain Arby's has developed a new sandwich that integrates fries directly into the meat-and-cheese stack. The sandwich is called the Arbynator. It is large and terrifying. 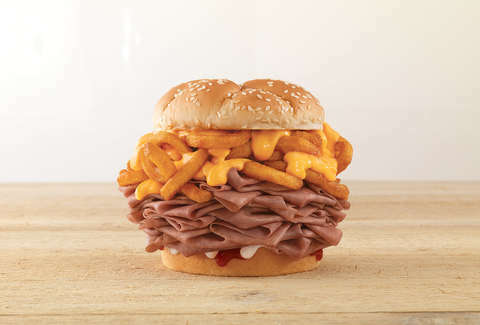 The ingredients include roast beef, curly fries, Cheddar sauce, Arby's sauce, Horsey sauce, and a sesame bun. As an Arby's spokesperson put it, "All of Arby’s legendary menu items/sauces on a single sandwich." It comes in classic, double, and half-pound sizes. If the half-pound version is something you think you can handle, you are a foolish and brave soul, but we salute you. Don't rush out this second though. The Arbynator is in just two markets currently: Oklahoma City, Oklahoma and Grand Rapids, Michigan. But if everyone takes their family and friends to those cities and orders it right now, Arby's will have no choice but to release it nationally, one assumes, so maybe consider that. In the meantime, be courageous: Stack your own fries. James Chrisman is a News Writer at Thrillist who will one day be stuffed inside a sandwich. Send news tips to news@thrillist.com and follow him on Twitter @james_chrisman2.